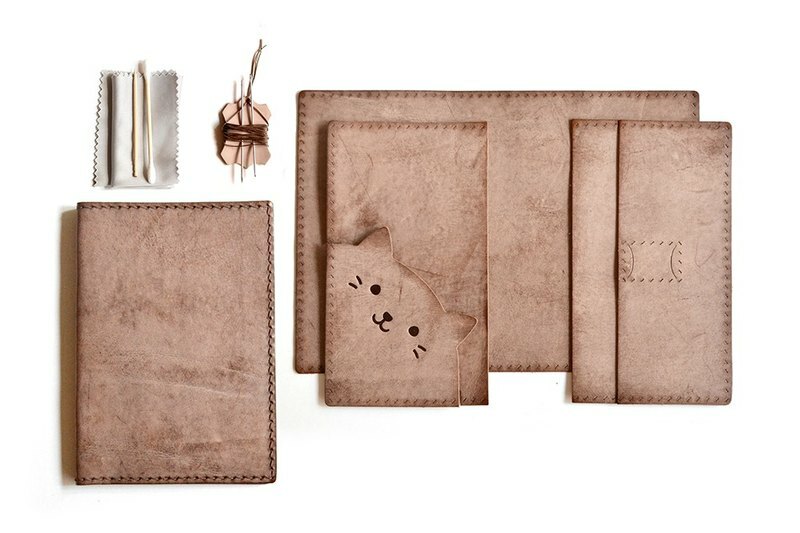 Kitten Passport Holder Leather DIY Kit Set: Tutorial video with large subtitles. Sewing holes are ready for stitching. https://youtu.be/aB1JCxDb5O4 https://cdn01.pinkoi.com/product/7eq6eXCV/2/800x0.jpg ※ Made with vegetable tanned leather ※ Tutorial video with large subtitles, easy to watch in the phone ※ Sewing holes are ready for easy stitching ※ We can engrave your name or initials (within ten letters). There are standard and italic fonts to choose from, which will make your item unique! The name will be engraved to the bottom right corner of the card slot by default. Materials include: die-cut leather pieces, needles, thread, polish cloth, cotton swab, toothpick, sandpaper. You have to prepare: old magazines, white glue, scissors, lighter, clips. Size: about 15cm height x 10cm width Structure: 2 ID card slot + 1 sim card slot + 2 pockets + 1 insertion slot Default color: dark brown wax leather with dark brown thread. Ordering process: Step 1: If you want to change to other leather color or thread color, please contact the designer first. Color reference: https://www.pinkoi.com/product/7eq6eXCV Step 2: Put the item in the shopping cart and fill in the personal information. Step 3: If you need to change the color combination or want to be name engraved, please fill the information in the <Remarks>. Step 4: The designer will confirm with you the details within 2 days after receiving the payment. Please reply in 2 days, otherwise it may delay the production and shipping date. Step 5: the order will be completed within 10 days of production and shipping. If the leather color you chose have to be waited for a longer time, the designer will contact with you to discuss the arrangement. Step 6: When the item is being shipped, shipping notice and tracking number will be provided.